Our motto is: Even if you can't be in Maine, you should still see Maine! 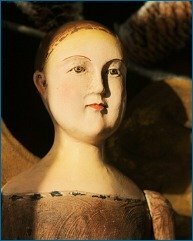 These pictures of Maine will give you a thrill, and maybe a chill, if you count the Halloween girls in the graveyard! Most of these pictures of Maine were taken by people with much more talent than me, but some I took myself, too. 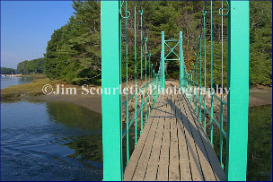 This is the dear Wiggley Bridge in York, Maine, one of the world's smallest suspension bridges. When my children were small, I used to hold the backs of their shirts in a death grip when we'd stand in the middle and make the bridge bounce - terrified they'd bounce right off into the water below! Twilight at Nubble Lighthouse. 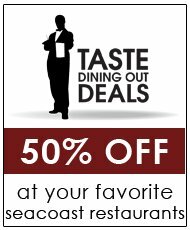 You can get your favorite flavor of ice cream at the take-out window at Fox's Lobster House at the lighthouse on a summer evening, then sit and watch night fall. A classic picture of Maine! 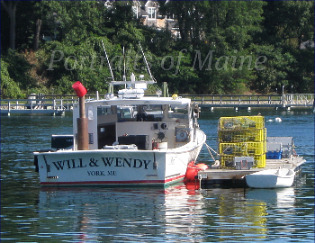 Lobstering is an important industry for many families in York, as it is throughout coastal Maine. This is one of the many lobster boats moored in the York river: and as so many York fathers do, this Dad named his boat after his two children. Lobstering continues virtually year-round in Maine, even through the cold of winter in New England. 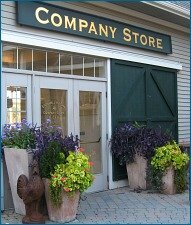 When people think of Kittery, Maine, next door to York, they usually think of the famous Kittery Outlets. 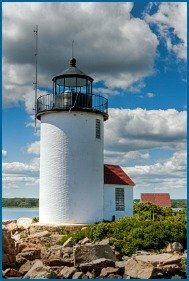 But there's a lot more to Kittery than shopping, and a drive on Route 103 through Kittery Point will bring you pictures of Maine like the beautiful moonrise above. 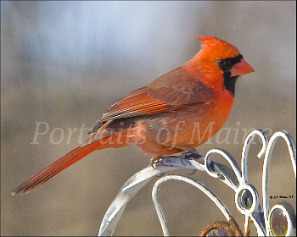 For me, it just isn't winter in Maine without seeing our bright red birds on the white snow. 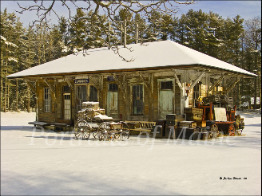 Quintessential pictures of Maine on Christmas cards almost always include red cardinals, pure white snow and the green pines of the Pine Tree state. 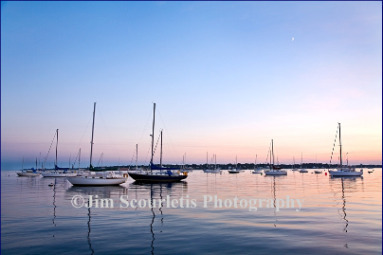 Great scenes of Maine don't necessarily mean the ocean or the mountains. The border between the Maine and New Hampshire seacoast is the Piscataqua River. Portsmouth, New Hampshire is on one side, and Kittery, Maine is on the other. 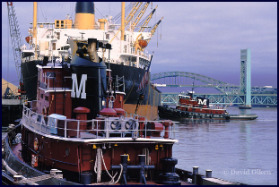 These tugboats routinely work in Portsmouth Harbor, and the bridges you see in the background are carry travelers between the two states. 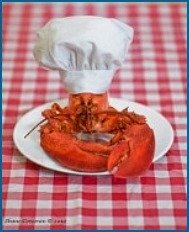 There just aren't any Maine-ier pictures of Maine than this one! 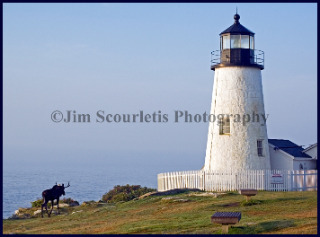 Blue sky, blue ocean, clear morning light, lighthouse AND a moose! Talk about your accidental tourist...this is Pemaquid Lighthouse. Did you ever wonder what it was like to be a Maine lighthouse keeper and see what they saw? 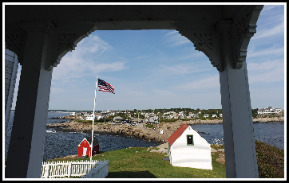 Over 100 years worth of brave men and women stood right here on the porch of Nubble lighthouse in York, looking back towards land. October in York Maine. I wish you could smell the leaves in this picture! The afternoon sun, being low in the sky as winter approaches, slants down through the foliage and lights the leaves on fire. 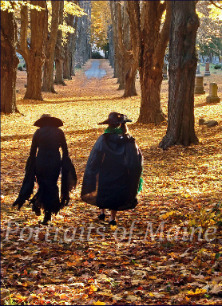 This is one of my favorite pictures of Maine, and not just because one of these young witches is mine!